Winter tends to be unreliable here in the midwest--Iowa especially. Dan & Danae planned a wedding for the first weekend of January, and I knew back when they told me (during their engagement session) that we'd be in for a ride by Mother Nature. Sure enough, the past three weeks have been bitterly cold! The high temperature during the day of the Gordon wedding was somewhere between 1 and 10 degrees...and wind chill made it feel much colder. Wind & snow or not, though, these two were bound and determined to have a bright, joyful wedding day! We began photos at Walnut Ridge Baptist Church, where Danae and her ladies were snacking on bagels, drinking sparkling cider, and getting made up. Knowing some of those women made the morning extra fun for me! Danae had chosen a gorgeous deep purple for her bridesmaids to wear, and I just have to say--this may be one of my favorite color palettes! Not to mention her ring...heavenly. I'm so thankful to have had the time for detail photos, especially the sweet heirloom handkerchief Danae carried! 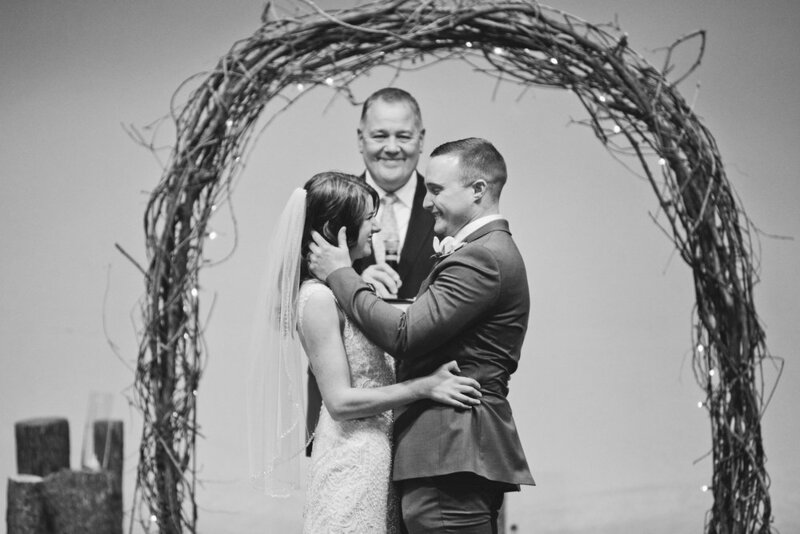 Dan and Danae opted to pray together before their first look, something few of my couples have done but really--it was such an emotional and heartfelt moment! They also allowed me to work my creative muscles, and we snagged some indoor photos inside the church before heading outside for a short session with the bridal party (and more couple's photos, of course!). The rest of the day went so smoothly! 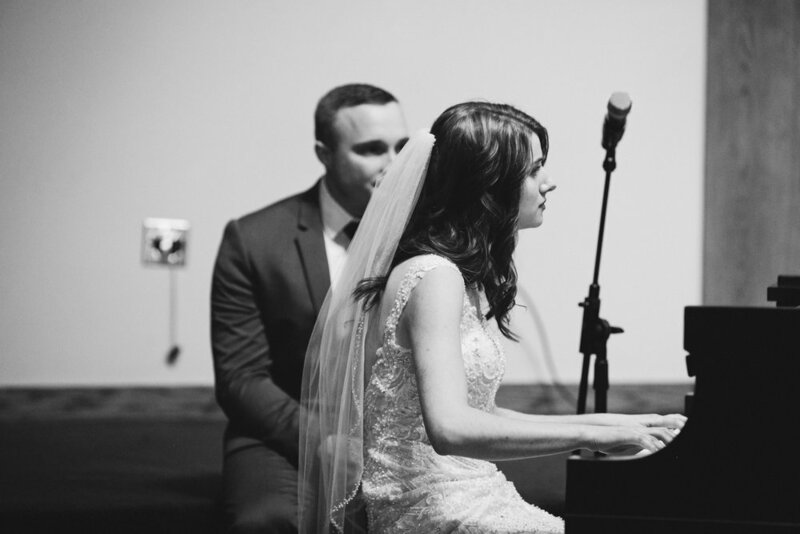 One of my favorite moments came during the ceremony: Danae, a music major, surprised Dan with a piano piece she'd written just for him. SO MANY EMOTIONS!! After the ceremony, we snuck out to snag a few more photos (see more about this on my Instagram) and then in to the warmth of their reception. Dan's two best friends & brother gave speeches, as well as Danae's sweet sisters. (Recognize one?! Miranda, her younger sister, was one of my senior photo sessions in Cedar Falls this fall!) And, at the end of the day, they exited amidst cheers and bell ringing from their dearest friends and family, into Dan's cleanly washed car, which he'd washed that morning. Thankfully, the doors didn't freeze shut and they made it off on their way to their honeymoon. ;) Happy ending to the happiest day!